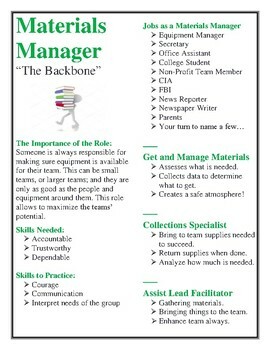 This has drastically increased my students engagement and success using these roles. 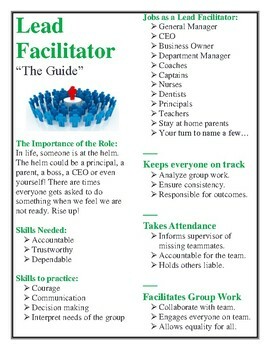 Students have a level of responsibility, accountability, and have learned to take initiative using their roles! They even encourage each other to show up so students don't have to take on additional roles. 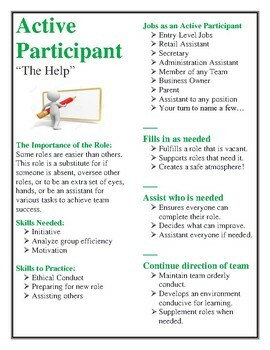 The active participant can either be a sub for a role, or assist and role. 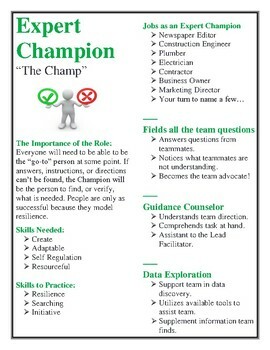 The Expert Champion will need to be able to follow directions and know what is happening in class. If they don't know what's going on, then it is up to them to show some resilience to find out. The Lead Facilitator leads the group when it comes to group readings, marking text, have a conversation, or even a "Stand, Share, Sit" with an article. Materials Managers will be the ones to get what is needed such as highlighters, chromebooks, textbooks, worksheets, equipment needed for the lesson, etc. Public Relations Director speaks on behalf of the group. They get to find out what everyone is thinking or agreeing to so they know what to share to the class when the time comes. The Tools and Assessment Checker keeps everyone on track, reminds everyone to their different reviews at certain points, and follows the time. Students will rotate and find which jobs they like the most. I also enjoy calling over all the "Lead Facilitators" and inform them of a reading strategy they can share with their group, or the "Experts Champions" so they know where some information might be that they will need. Each role in this PDF are their OWN posters! 6 posters in 1! Each Poster explains the role, skills to practice during the role, skills needed to do the role, jobs relating to this role, and outlines some specifics of what they need to be responsible for. Students will love to hold each other accountable. I printed them on 20x30 papers with our districts printers, and students have loved to call each other out on what they are supposed to do.